You are here: Home / News / Lindsey Harding Makes A NBA Coaching And Scouting Breakthrough. Lindsey Harding Makes A NBA Coaching And Scouting Breakthrough. (ThyBlackMan.com) Other than being an actual player in the NBA, the most high profile titles in the NBA (other than owner of a NBA team) are head coach and general manager/president. The NBA is now as talented as it has ever been before with a diversity of different talents from all over the globe. The head coaches in the NBA have more diversity in their coaching staffs as ever with women now as assistant coaches in the NBA the last few seasons. There has been much focus on the experience and respect for Nancy Lieberman’s work as an assistant coach for the Sacramento Kings and the potential for San Antonio Spurs assistant coach Becky Hammon to receive consideration for NBA head coaching jobs. There has even been in-roads made with women in NBA scouting, which can be a stepping stone towards being a NBA general manager, when current Dallas Mavericks assistant coach Jenny Boucek performed advanced scouting work for the Seattle SuperSonics in 2006. However, while all of those women broke barriers entering the NBA it is the hiring of Lindsey Harding as a full-time scout for the Philadelphia 76ers that breaks another important barrier. 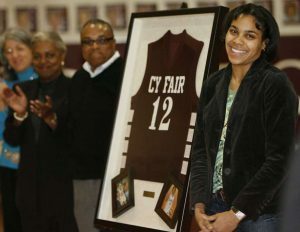 Lindsey Harding was a two-time All-America selection at Duke during her collegiate basketball career in the 2000s. She led Duke to two trips to the Final Four before being selected as the first overall pick in the 2007 WNBA Draft. Her nine year career in the WNBA was spent playing for six WNBA teams. In terms of her playing career, Lindsey Harding has done quite a bit in the game of basketball. Her new career as a scout in the NBA is noteworthy because she is a black woman in league where black women have not made the same progression as white women. Basketball fans are aware of the impact of Violet Palmer as a high level female NBA official for many years but there has not been an equivalent for black women pursuing coaching or scouting positions in the NBA. Among the three current female assistant coaches in the NBA, none are black and only Los Angeles Clippers assistant coach Natalie Nakase is a woman of color. Her smarts as a former point guard will be helpful in her evaluation skills of players because point guards are often extension of head coaches and must be among the smartest players on the basketball team. It is not surprising that former high profile point guards like Magic Johnson and Doc Rivers have become evaluators or coaches following their playing careers. Lindsey Harding hopes her career can follow a similar path.